YOUGHAL, IRELAND – “The whole thing is a giant fraud,” was perhaps too much for an unprepared audience to take on. Your editor, in trying to explain why the U.S. money is “fake,” had perhaps bitten off more than he could chew… at least in the context of a panel discussion in Ireland on cryptocurrencies. We’ll return to Kilkenny in a moment. Back in New York yesterday, investors were worried. The Dow had sold off by more than 500 points by 3 p.m. By the time the bell sounded, it was down 602 points. This is a market that – like a nervous passenger at a bus stop – is eager to go somewhere. Sooner or later, it will get there. It was a lively discussion at the Kilkenomics Festival. We were joined on stage by our old friends Dominic Frisby, who writes for our MoneyWeek magazine in London, and Jim Rickards, a colleague from America. Both Dominic and Jim know far more about cryptocurrencies than we do. But they come to opposite conclusions. Jim is certain that cryptos are not much more than a scam and a bubble. Dominic, on the other hand, is an “early adopter,” who is convinced that cryptocurrencies will replace government-issued paper money. Cryptos are bold experiments, like mutations in the money gene pool. Almost all will fail… as many innovations do. But some form of digital money, perhaps built on blockchain technology, will probably succeed. And most likely, it will be sponsored and controlled by the feds. We confessed at the outset that we know nothing about cryptocurrencies, except that we don’t like them. But we claimed a more-than-average knowledge of money itself. Explaining, we took the crowd back to August 15, 1971, and showed how economist Milton Friedman had encouraged President Nixon to dump the gold-backed dollar in favor of one that would “float” on a sea of supply and demand, expertly guided by the skillful navigators at the Federal Reserve. This led us to describe not only America’s fake money itself, but the whole armada of fake money and fraudulent information (especially the price of credit), and how they were used by the few to rip off the many. The audience looked puzzled. What the hell was I talking about, they wanted to know. Then you’re ready to start a new side hustle. 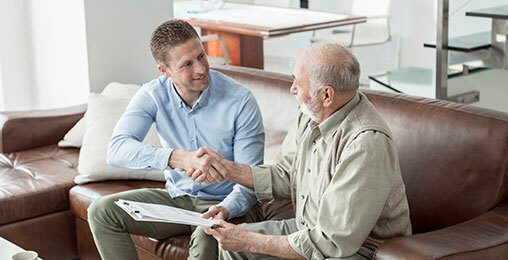 You could operate a “micro business” which brings in $208,000 or more in 2019. I’ve put together a step-by-step strategy which makes it very possible (easier than you think). We hemmed and hawed, stalling for time as we searched our brain looking for the right answer. The short answer was that the 1971 change was not intended to be permanent. But once the elites saw that it was making them rich, they didn’t want to give it up. “Well… Remember, the first 10 years of the system were disastrous – just as the old-timers predicted. The new credit-based money did exactly what it should have done: it went down. Inflation went to 9%. And then, inflation expectations had gotten so deeply embedded in the economy that Paul Volcker had to put the federal funds rate up to 20% to overcome them. “And because Volcker defied the politicians… and much of the public… by sticking to his “hard money” program, he was able to save the system… for a time. That is, he showed that the authorities would make sure that the new money acted like the old money, more or less. “Instead of the old feedback loop, where gold automatically stopped the feds from issuing too much money, the Fed itself would keep a lid on the money supply. But you couldn’t really trust it. It looked like the old money. It acted like the old money. It pretended to be just as “good” as the old money. Except, it wasn’t… not at all. However, tomorrow, America will embark on the biggest project in the country’s history – one that could unlock $10 trillion in profits by 2020. And three stocks will play a major role in this revolutionary new project. Invest soon and you could make a fortune, too. The new, fake money succeeded largely because of a historical accident. Volcker came along at the very bottom of a stock, bond, debt, and economic cycle. Putting the screws to inflation, he allowed the economy to begin a very natural, healthy expansion that carried it along (with more help from the Fed) for the next 36 years. It was only two years ago – in 2016 – that the interest rate cycle finally turned. Another big part of that accident was the arrival of the Chinese into the world economy. Increases in fake money usually lead to increases in consumer prices (which is what happened in the 1970s). But, beginning in 1979, hundreds of millions of Chinese workers began laboring in unheated factories for $10 a day so that Americans could enjoy Everyday Low Prices at Walmart for the next four decades. Those lucky trends have run their course. And now, the U.S. economy faces a historical accident of another sort… with much different consequences. Total debt in the U.S. was only 1.5 times GDP in 1971. Now, it is 3.6 times GDP. And the federal government only owed $390 billion in 1971. Now, it owes $21 trillion. And now, instead of being at the bottom of a cycle, the U.S. is near the top, with very high stock and bond prices… and the lowest unemployment in four decades. All the positive trends of the last 30+ years will now turn into negative trends. Expect falling stock and bond prices… rising unemployment… rising consumer prices… and higher interest rates. Fake money rarely survives a full market cycle. We doubt that the fake dollar will either. “The fundamental unfairness at the heart of the U.S. economy is that this fake money was not distributed evenly,” we said. “It was used to buy bonds. So it went into the financial markets, where the rich, the privileged, the insiders… and people like Donald J. Trump… own the assets. “The Fed increased the U.S. monetary base by some 400% in the last 10 years alone. That money – magnified by credit and markets – is what made the rich so much richer. It’s why the elite won’t give up their fake money system – not without a fight. And it’s why Donald Trump is already pressuring the Fed to stop trying to “normalize” interest rates. 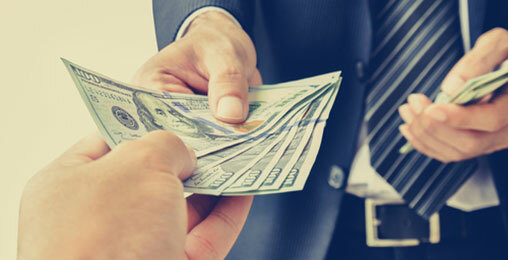 Recently, we showed you that gold-backed exchange-traded funds sold gold as investors exited these ETFs during the third quarter. With the first month of Q4 in the books, that trend seems to be reversing. 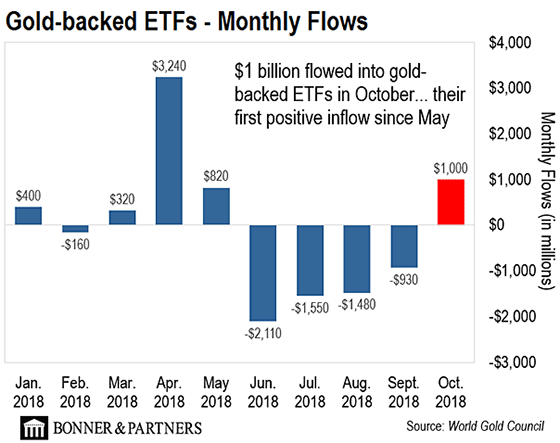 That’s the story of today’s chart, which tracks investment dollars moving in and out of gold-backed ETFs each month since the start of 2018. As you can see, $1 billion flowed into gold-backed ETFs in October… which was their first positive inflow since May. This came as the S&P 500 shed nearly $2 trillion – prompting investors to seek safe-haven assets. The fact that gold rallied while the S&P sold off in October shows why gold remains an important asset class in 2018. While there have been headwinds for gold over the past six months, there are clear reasons for gold to move upwards. The global economic recovery has been uneven, hurting [emerging markets]; complacency has crept into the market, questioning liquidity; market valuations are at extreme levels; debt has grown substantially globally, and increased tightening could hurt markets. All these factors, either individually or in combination, could be catalysts for a risk-off environment that could propel gold higher. As Bill has said in the past, everybody should own some gold. With stocks coming off of a volatile October, that advice could be more important than ever. There’s an old saying: “There’s no such thing as a free lunch.” That simply means that if you’re not paying for something up front, you’re paying for it down the line. In investing, “free” services should raise a few flags. A new technology is in development. It could rewrite the entire healthcare industry, and allow patients to live well past 100 years. As Jeff Brown showed you recently, self-driving cars are quickly becoming a reality. Starting in December, Waymo, the Google-owned self-driving technology development company, will launch the world’s first commercial driverless car service. I think Trump is doing a great job. And you seem to criticize him. Who are you? Tell me. You sound like the Democrats, except they are plain evil and need to be stopped. At least Trump is getting things done. He has my support. I guess I am determined, but at least Trump is trying. What are you doing? Oh, I concur! Trump will definitely leave his mark on history… He’ll do something stupid (like everything he’s done for the past 22 months), that will send the house of cards that is the American economy into a pancake collapse. Then, while everyone is running around like chickens with their heads cut off because the wheels of commerce have come to a grinding halt, he’ll declare martial law and fulfill his dream by setting himself up as a dictator à la Putin, Jong-un, and Erdoğan. Shame on you, Bill Bonner. I gave you more credit than what you are espousing. Trump has accomplished more for the U.S. than the last four presidents combined. His heart is in exactly the right place, and his mind is brilliant and creative. He is not in office to serve himself – as did Obama and the Clintons, who undermined America for their own gains. How about supporting a guy with real guts and courage. I had stopped reading your articles (which I used to enjoy) after you became all about Trump all the time, usually bashing our president. After such a long stretch, I thought surely Bill is now more even-handed, he has to be all Trumped out. Nope. The sun still rises and sets with every wrong move Trump makes. Because we know, conservatives were still pure and the economy wasn’t a bubble ready to burst over INSERT PRESIDENT HERE. Nope, everything went swimmingly. He might not go down as the greatest president, but he sure as hell won’t be the worst. 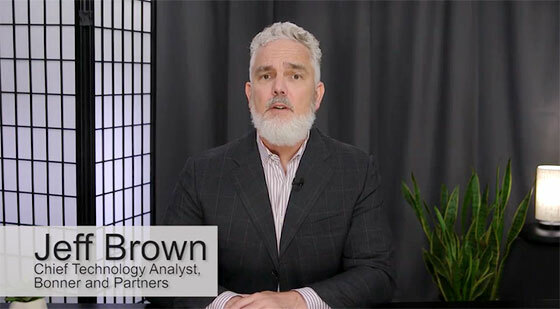 Jeff Brown, Bill’s top technology analyst, believes he’s uncovered the investment opportunity of a decade. But in order to position yourself for the best gains, you’ll want to get in before tomorrow, November 14. At that time, an event will take place that will likely boost these three small-cap tech stocks higher. Get the full details here.